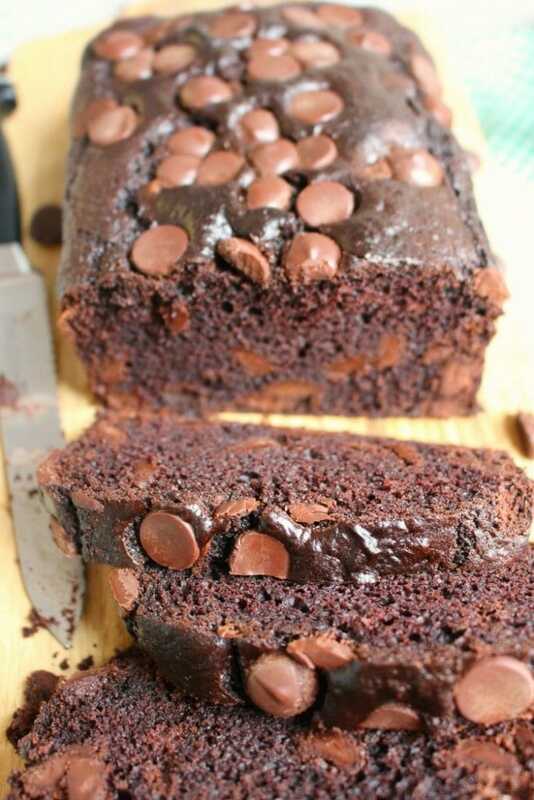 Looking for an amazing chocolate zucchini bread recipe? This Double Chocolate Zucchini Bread is the perfect sweet, quick bread that’s packed with fresh zucchini and loaded with chocolate chips! Growing up in rural South Dakota, it was always a part of our summer ritual to have a big, often times out of control, garden. Green beans, cucumbers, tomatoes, and always zucchini! For whatever reason, there was always a huge zucchini yield, which had my mom searching for ways to use and enjoy this delicious green squash. Cakes, muffins and zucchini bread, specifically chocolate zucchini bread was always made with this garden veggie. 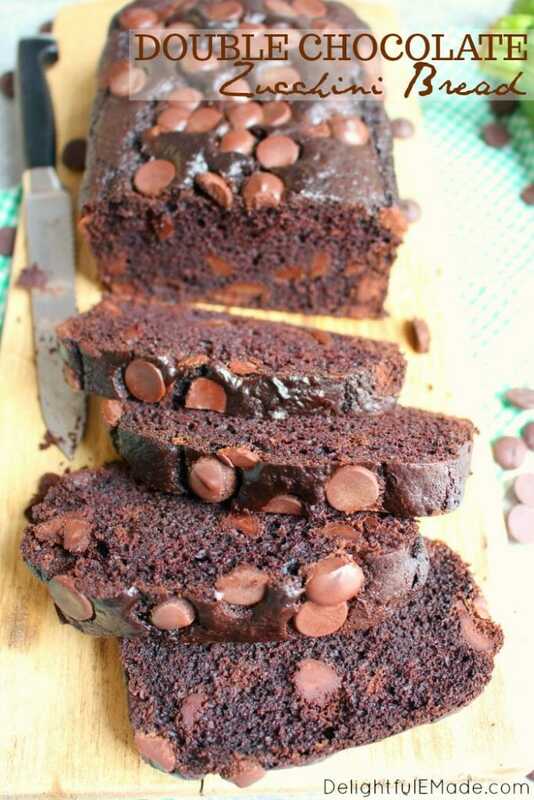 This cake-like chocolate zucchini bread recipe is an adaptation of my Triple Chocolate Muffins. 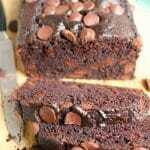 I removed the white chocolate chips and added plenty of fresh, shredded zucchini and as a result, came this moist, tender chocolate quick bread! It just takes a few minutes, but I personally like to shred the zucchini before I even start mixing the batter. Not only does this help let out any excess water in the zucchini, but it is then ready to go when it needs to be mixed into the batter. 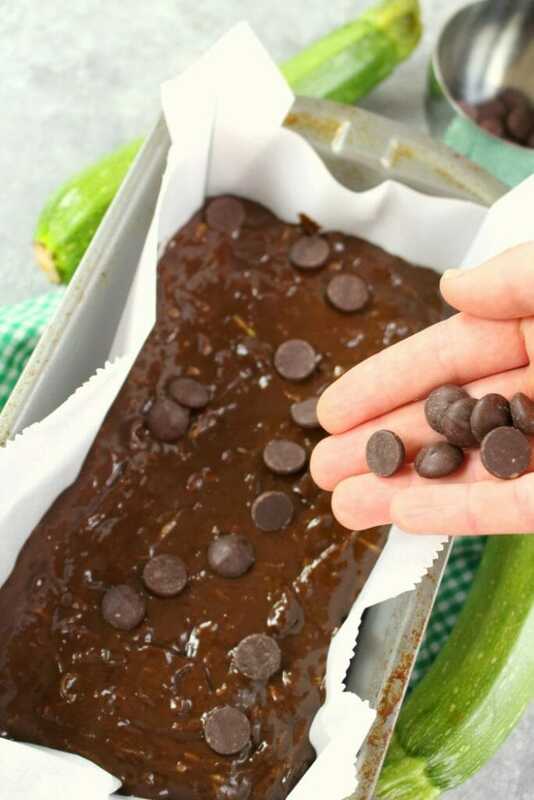 The zucchini is actually a key ingredient for a really moist, delicious chocolate zucchini bread. From here, mix the wet ingredients in a large mixing bowl. In a separate bowl, sift together the dry ingredients. Don’t skip the sifting. Cocoa powder often times has small lumps, which you don’t want in your batter. Sifting together the flour, cocoa powder, baking soda and salt will remove any lumps and combine the dry ingredients perfectly. Gradually add the dry ingredients to the wet ingredients. 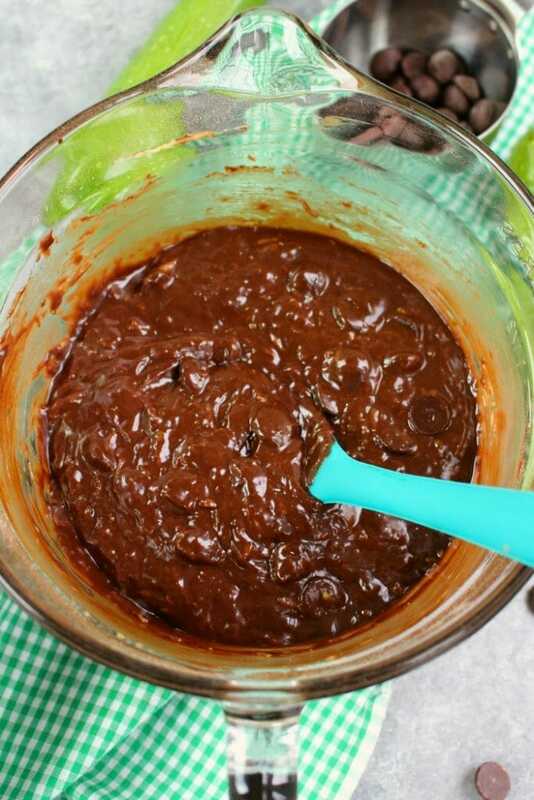 The chocolate zucchini bread batter will be thick, almost like brownie batter. Once you’ve mixed together the batter, fold in the shredded zucchini and chocolate chips. 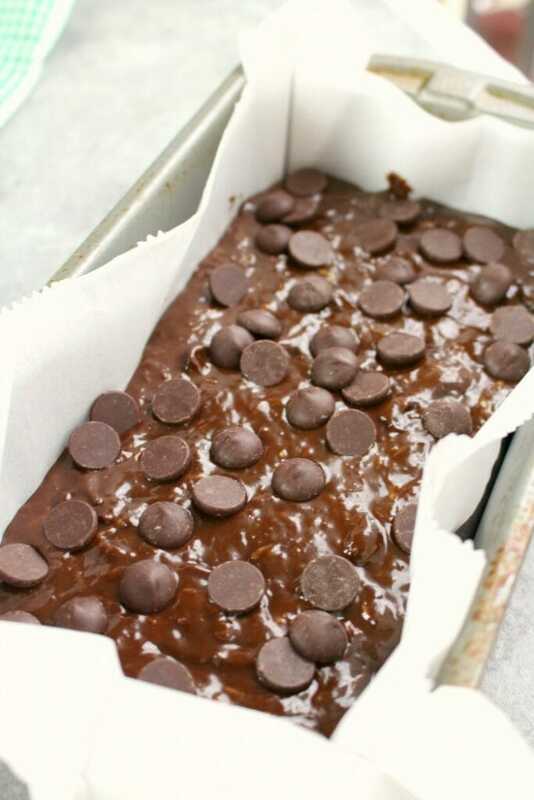 The recipe calls for 1 cup of chips – 2/3 cup of the chocolate chips are folded into the batter. Make sure to reserve the last 1/3 cup for topping the bread. 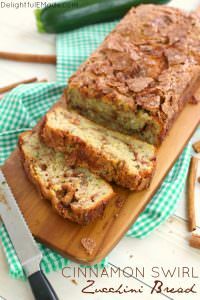 Pour the batter into a 9×5″ loaf pan that has been lined with parchment paper. 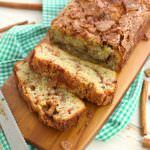 Using parchment paper has become my favorite way to bake quick-breads, as it makes it very simple to lift the loaf out of the pan after it has baked. 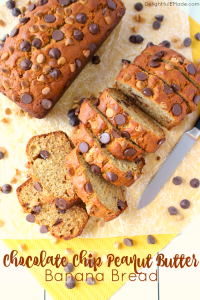 Check out my post for Better Than Starbucks Pumpkin Loaf to see exactly how I do this – hint, I use plain ‘ole binder chips to secure the paper to the pan! 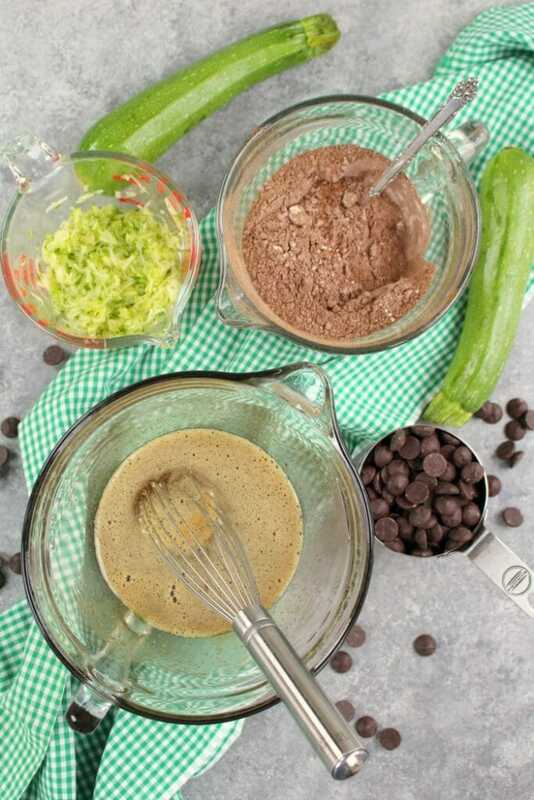 Top the chocolate zucchini bread batter with the reserved chocolate chips. Bake at 350 degrees for 50-55 minutes. Once the bread comes out of the oven, be sure to let cool to room temperature. You can then simply remove the bread from the loaf pan by lifting it out from the sides of the parchment paper. 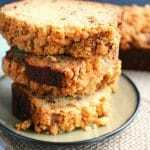 The paper will easily peel away, and leave you with a nice, neat loaf of Double Chocolate Zucchini Bread that is easy to slice and serve. Step 5: Slice and Enjoy! 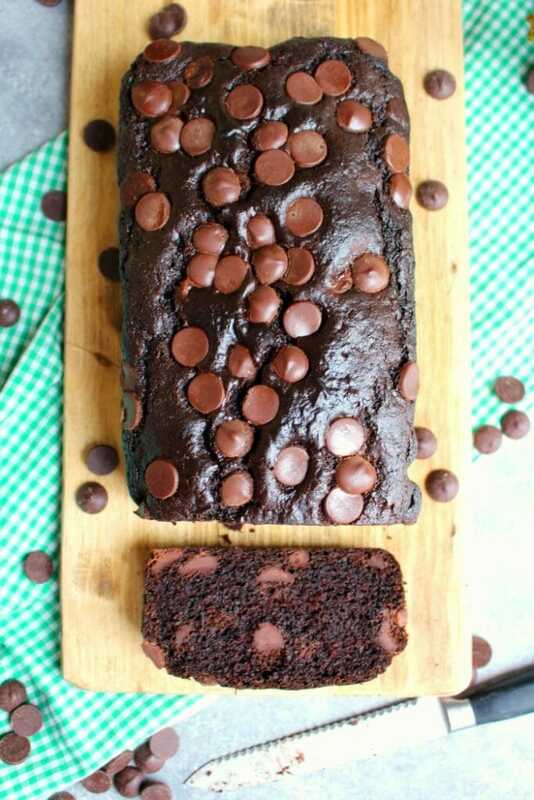 From here, this moist, delicious chocolate zucchini bread is ready to slice up and enjoy! 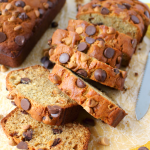 It’s fantastic with your morning coffee, and perfect as a mid-day snack. Wrap up and add to your kids lunchbox for a yummy treat! 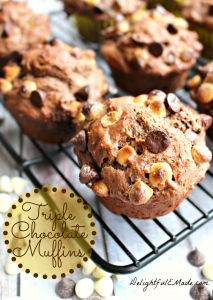 They’ll never know there are vegetables hidden in this delicious chocolate treat! 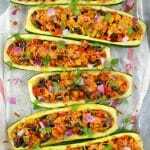 Looking for a delicious way to enjoy all that fresh summer zucchini? 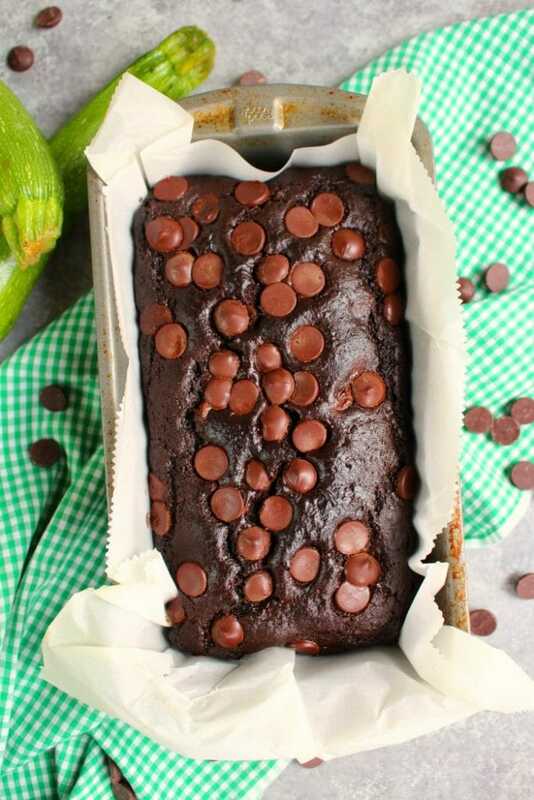 This Double Chocolate Zucchini Bread is the perfect sweet, quick bread recipe that's packed with fresh zucchini and loaded with chocolate chips! Over a plate, shred the zucchini. Set aside. In a large mixing bowl, whisk together the brown sugar, oil, eggs and vanilla making sure to break apart any brown sugar lumps. In a separate bowl, sift together the flour, cocoa powder, baking soda and salt. Don't skip the sifting - it's important to make sure any lumps in the cocoa powder are broken apart and well incorporated with the other dry ingredients. Begin gradually adding the dry ingredients to the wet ingredients. After all the wet and dry ingredients are combine, add in the shredded zucchini, and stir until incorporated. 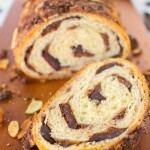 Fold in 2/3 cup of the chocolate chips, reserving 1/3 cup for the top of the loaf. Pour the batter into the prepared pan. Top the batter with the reserved chocolate chips. Bake at 350 for - minutes. Test the bread by inserting a toothpick into the center of the loaf. If the toothpick comes out clean and crumb free, the bread is done. Remove from oven, and let cool to room temperature. Remove the loaf by pulling on the excess parchment paper. 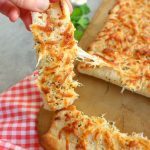 Slice and enjoy right away. 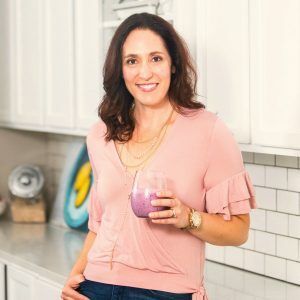 Store any leftovers in an airtight container at room temperature. I used Ghardelli semi-sweet chocolate chips. These are a larger-sized chocolate chip that works really well in this recipe. Feel free to use any type or size of chocolate chip. 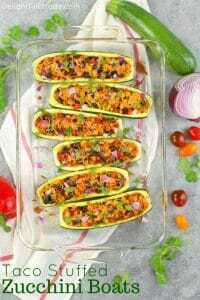 OH I bet I could definitely get my kids to eat zucchini this way! Looks so good. Pinned.